“Room Five-Hundred-and-Four.” Words by Eric Maschwitz, music by George Posford. Composed for the Eric Maschwitz revue New Faces (1940). Recorded by Elsie Carlisle under the musical direction of Jay Wilbur in London on February 10, 1941. Rex 9934. Elsie Carlisle committed “Room Five-Hundred-and-Four” to shellac in her last year of recording. While I generally prefer the underlying compositions of her earlier period, it is delightful to hear her voice on her later Rex-label records. Elsie’s later style of singing seems slightly more confident, and the crisp beauty of her voice is made even more evident by the more modern recording techniques available by that time — in spite of Rex’s reputation for “crackly” shellac. The studio band’s virtuosity is showcased nicely in their rather swingy instrumental segment. Other versions of “Room Five-Hundred-and-Four” were recorded in Britain in 1940-1941 by Vera Lynn (accompanied by Jay Wilbur and His Band), Geraldo and His Orchesta (v. Dorothy Carless), The Savoy Hotel Orpheans (dir. Carroll Gibbons, v. Anne Lenner), Ambrose and His Orchestra (v. Ann Shelton), again by Jay Wilbur and His Band (v. Anne Lenner), and by Binnie Hale. “To Be Worthy of You.” Words by Benny Davis, music by John Frederick Coots (1931). Recorded by Elsie Carlisle with orchestral accompaniment on February 9, 1932. Zonophone 6069 mx. OY2687-2. “To Be Worthy of You” was composed in 1931 by Benny Davis and John Frederick Coots. Davis had written the successful standard “Baby Face” back in 1926, and Coots would go on to co-write the best-selling “Santa Claus Is Coming to Town” in 19341 “To Be Worthy of You” did not have the staying power that those other songs enjoyed. Indeed, the melody falls short of being particularly infectious or compelling, and the lyrics initially seem gushy. I do think, however, that the words express sentiments that are comparatively deep for a popular song, and that Elsie Carlisle’s version is a rather elegant realization of the song’s possibilities. At first it would seem that Elsie is merely expressing her satisfaction at having found a love partner whose merits are so great that she feels scarcely worthy of having him. In fact, she is rejoicing in having resolved to be a better person: “Watch the way that I’ll come through / To be worthy of you.” The idea of being transported, not just with the joy of love, but also with delight at having discovered in another person the means of self-improvement, is really extraordinary. Elsie’s singing in this comparatively simple arrangement is nothing if not refined. Her anonymous accompaniment is also noteworthy, in particular the pianist, whom Richard J. Johnson tentatively identifies as Bert Read2, a constant fixture at Elsie’s recording sessions (especially in his role as an Ambrose man). Whatever this pianist’s identity, his flourishes contribute a great deal to the overall bright, crisp sound of the recording and to the idea that we are dealing in this piece with an elevated mental state. “To Be Worthy of You” was also recorded in a radio transcript in 1931 or 1932 in America by Gus Arnheim’s Cocoanut Grove Ambassadors (v. Loyce Whiteman). In Britain it was recorded by Roy Fox and His Band (v. Al Bowlly), Ambrose and His Orchestra (v. Sam Browne), and the Savoy Hotel Orpheans (v. Jack Plant). “Ya Gotta Know How to Love.” Words by Bud Green, music by Harry Warren (1926). Recorded on October 6, 1926 by Elsie Carlisle with piano and vocal accompaniment by Carroll Gibbons. Zonophone 2815. This time not a swank lunch, but a very informal party. Elsie was asked to sing. No, she hadn’t her music, but a quiet, bespectacled young man at the piano knew all the latest numbers, and could instantly transpose into any key Elsie wanted. She sang several numbers which went down well, but the outstanding thought in Elsie’s mind was what a good accompanist this young man was. And when he played some piano solos on his own afterwards her opinion of him went up. She asked who he was. That was in the days when Carroll was striving to make a name for himself. Elsie and Carroll used to meet quite often after that party, as they held each other in mutual esteem. Well, now here’s a secret. Even his best friends will admit that Carroll has a “queer” voice. Those melodious deep tones, so very “Southern” are a characteristic. His announcements are fun, but you can’t imagine him as a singer, can you! Yet it is a fact that Carroll and Elsie not only made gramophone records together, but on at least one of them Carroll sang part of the vocals! Yes, that vocalist is a fine pianist! But if you want to hear Elsie in another vocal team, just try to get one of the old copies of a certain Zono record! If you’re lucky, you’ll hear a then unknown singer, a Miss Carlisle, singing with a certain Mr. Gibbons, a new pianist, trying to make a name for himself as a Bing Crosby! “Ya Gotta Know How to Love” is a Harry Warren tune that is infectious in spite of, or perhaps because of, the simplicity of Bud Green’s lyrics. It does not develop its theme much past the idea contained in the title of the song, namely that in a love relationship, a certain savoir faire is required (with the additional warning that one’s “baby” will be inclined to want expensive things). Elsie Carlisle adopts the persona that she has in many of her early recordings, that of the fetching, frenetic flapper. 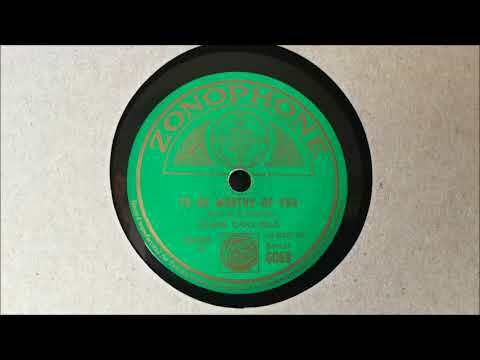 “Ya Gotta Know How to Love” was recorded in America in 1926 by Sam Lanin and His Orchestra (as Chick Nelson’s Collegians) with Arthur Fields as vocalist, Irving Aaronson and His Commanders (with vocals by Harold Saliers), Esther Walker, the California Ramblers (with Frank Harris, who may be Irving Kaufman going under a pseudonym), Fess Williams, the Varsity Eight, the Locust Sisters, Peggy English, and Betty Marvyn (unissued). In Britain, in addition to Elsie Carlisle’s recording, there were versions of “Ya Gotta Know How to Love” by Bert Firman’s Cabaret Novelty Orchestra and by Jack Hylton and His Orchestra (with Jack Hylton providing the vocals). 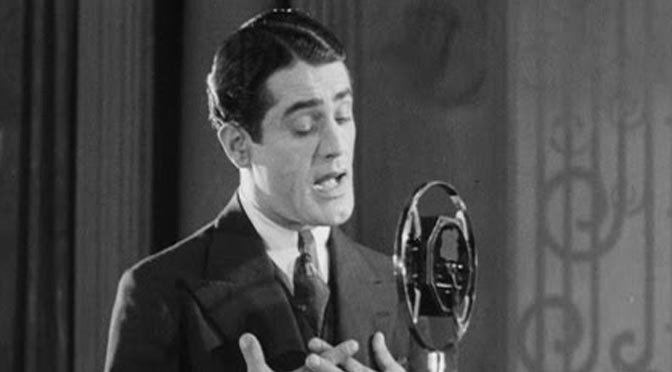 Today we remember Al Bowlly, that unique interwar singer who was perhaps unrivaled in his ability to project vocally a persona of romance and sophistication. On April 16, 1941, Bowlly returned from giving a performance in High Wycombe and stayed up late reading, in spite of an intense Luftwaffe air raid. On the morning of April 17, a German parachute mine that had fallen outside his building exploded, killing him, amongst others. Bowlly was given a funeral at a Greek Orthodox Cathedral in London and buried in Hanwell Cemetery in a mass grave for bombing victims.